Spoiler: Incessant tapping won’t make a walk sign appear any faster. Our safety relies on them. We tap without second thought. Yet to the average pedestrian crossing the street, exactly how push-to-walk buttons work remains a mystery. Do they send a signal to the stoplight to turn green sooner? Or, is it just a placebo to make impatient pedestrians feel like they have some control while they wait? Full disclosure: This question came from a Seattle Times staffer. But because everyone uses the buttons, we figured the answer was worth knowing. First, types of pedestrian-crossing systems in Seattle vary by location. All include a network of underground wires that send signals between the sidewalk buttons to computers connected to traffic lights. Here’s what’s key: Most walk signs in downtown and other dense areas activate on a timed schedule, regardless of whether someone hits a button. Others require a tap to change the pedestrian signal. The thing is, there’s no foolproof way to tell which is which. For instance, more than 30 intersections on Mercer Street — where crews installed new, adaptive traffic lights this spring — do not flash walk signs unless people call for them with the buttons. Signals at Capitol Hill’s Broadway East and East Pike Street intersection, on the other hand, cycle automatically, even if no one pushes the button. 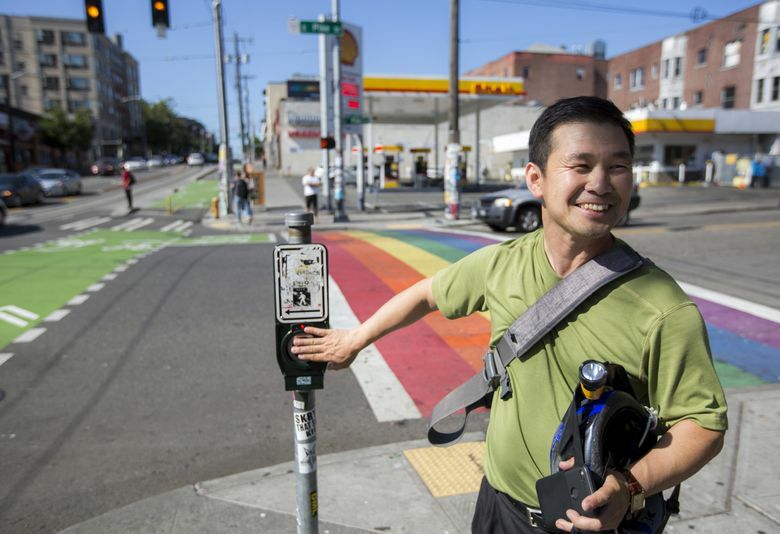 They typically flash a walk sign for seven to 10 seconds and red hand for 11 seconds each cycle, said Dongho Chang, Seattle Department of Transportation (SDOT) city traffic engineer. Seattle generally follows federal guidelines for determining how long walk signs appear at intersections, and that time varies by location and is based on criteria such as street width and amount of traffic. Timing aside, SDOT says about 15 percent of Seattle’s 1,066 signalized intersections use vibration technology and speakers to aid people who are deaf or blind to safely cross streets. The department plans to install that technology at six to 10 more intersections next year. Those systems — with the arrow-shaped push button that’s positioned on poles about waist high — are called Accessible Pedestrian Signals. Other buttons are typically circular or cone shaped. SDOT considers an intersection’s traffic volume when deciding what kind of pedestrian-crossing system to install, according to spokeswoman Mafara Hobson. In 2011, SDOT launched a new program for counting people traveling by foot and bike to better understand how people get around. Officials do the spot counts on a quarterly basis at dozens of intersections across the city, using methodology created by the National Bike and Pedestrian Documentation Project. In 2015, the most recent year for which data is available, SDOT recorded 273,631 pedestrians for the year, up roughly 10 percent from the previous year. Broadway and Pine — aside from Pike Place Market, of course, where crowds of thousands clog the roadway daily, Chang said. SDOT counted nearly 24,000 people in 2015 at the Capitol Hill location alone, according to the department. On a recent afternoon, Chang demonstrated how the self-activating pedestrian system works there, an often-congested roadway with bike lanes and a streetcar. The system periodically shortens pedestrians’ crossing time to get cars moving and out of the streetcar’s way, he said. “Broadway has so many people that a person (in a car) making a right turn will just hold up the streetcar for the entire light cycle,” Chang said. 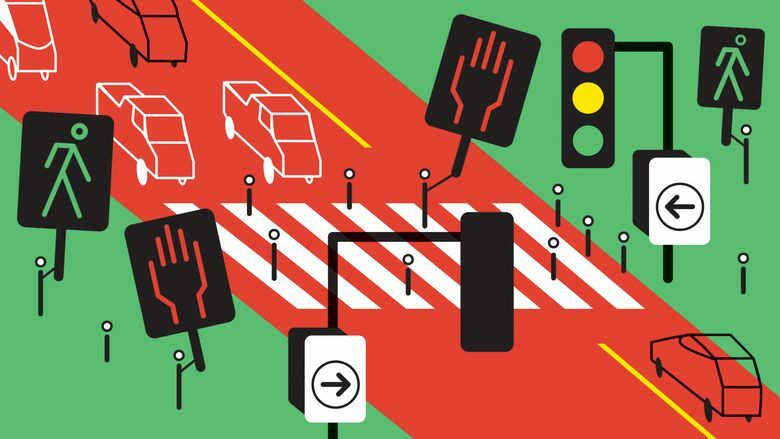 What about the intersection with the most pedestrian-car accidents? SDOT recorded seven collisions involving pedestrians at the Fifth Avenue and Spring Street crossing in the past three years. That’s the highest of all downtown intersections, the agency reported. More than half of all crashes involving pedestrians in 2015 (522 total) happened at marked crosswalks, according to SDOT data. Three of those crosswalk accidents resulted in fatalities and 14 in serious injuries. Those statistics are part of a broader trend of fatal pedestrian accidents rising across the country in recent years. One way to help avoid getting hit? Put down your phone. A recent Pemco Insurance poll showed we are walking while distracted more than ever. More than 50 percent of respondents in Washington and Oregon reported using their phone to talk, text or read while on foot. Last week, we shared advice on finding on-street parking spots in Seattle after one reader questioned the city’s rules for curb painting. And the week before that, we tackled someone’s question about requiring bike owners to pay a licensing fee like car owners do.